When your home has high-quality windows, you can save money on energy bills and feel more comfortable. In fact, drafty windows can let air escape and increase your energy bills by 10 to 25%. If you are feeling chilly this winter, it might be time to think about scheduling residential window replacement. And Best Windows is here to help. Our team is running a special offer for our customers. 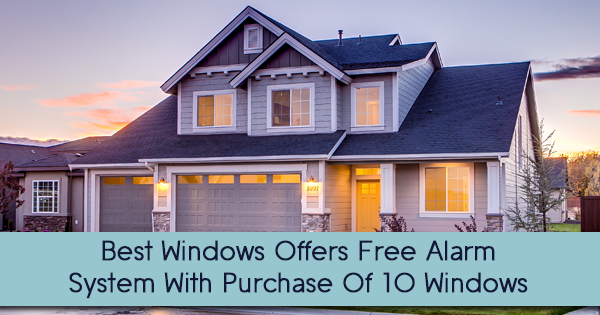 When you purchase 10 home windows, we will gift you a free alarm system worth a $700 value. By opting into this offer, you can protect your family with an alarm system while also keeping them comfortable. There is nothing quite like a fresh set of windows to upgrade your home, and Best Windows wants to give you the incentive to make this update. Why opt into this offer? There are plenty of reasons. Security: A home alarm system can provide an extra layer of safety for you and your family, so you can rest easier. And with this offer, you can get $700 worth of security products for free. Efficiency: Best Windows is committed to offering quick service for our customers, so you can expect a quick turnaround time when you purchase this offer. Quality: Here at Best Windows, we strive to live up to our name. You can expect high-quality workmanship and products from us, relying on your windows for years to come. Customer Service: Once you start working with us, you can expect exemplary customer service. Whether you are having trouble with your windows or simply have a question, we will be there to help you out. Trust: Home windows is what we do. You can rely on us to get the job done right the first time and provide you with trustworthy products. To take advantage of this offer today, contact us. We will get the process started right away and you can schedule your installation. Here at Best Windows, your comfort and security are our priorities, and this offer provides both. We look forward to working with you and your family.